The third and final event in the Yellow Pages Athletics Series takes place in the Mother City on Thursday 10 March at the Bellville Stadium and offers athletics followers a number of interesting duels. A key event will be the men’s 5 000m. Not only will it be the ideal opportunity for athletes to attempt to qualify for the World Championships in Deagu, South Korea in August, but the question of whether Steven Mokoka has a chink in his armour could well be answered.Mokoka had beaten everyone in the track season so far, winning the men’s 3 000m in a fast sub 8 minute time at the first Yellow Pages event in Potchefstroom on 19 February; then showing a quality field a clean pair of heals in the 1 500m a week later. However, Mokoka’s aura of invincibility may have taken a serious knock after his sixth place finish at the African Cross Country Championships in Cape Town on Sunday 6 March. Mokoka had taken the fight to the Kenyan’s on the first two of the six lap course, but then ran out of steam and Kgosi Tsosane was the best of the South African’s finishing in fifth. 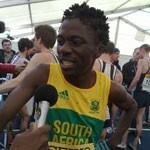 Mokoka will be facing Tsosane in what promises to be a cracker of a race in the men’s 5 000m. Mixing it up with them is the 2009 SA Cross Country Champion Xolisa Tjali. Throw in the South African record holder Shadrack Hoff, and you have all the ingredients of a superb race. Hoff, although not nearly in the shape that saw him run the SA Record of 13:14;16 in Gateshead in 1995, has gone on record as saying he will show the “young pups” how to run a 5 000m. He will have his work cut out for him though. The 5000m will be but one of an action packed programme for athletics followers. Gates open at 16h30, pre programme starts at 17h00, with the main programme getting underway at 18h30. Tickets are available at the gate at R20 for adults and R10 for children.